Really pleased today to be part of the blog tour for the superb Tomorrow's Guardian with this interview with author Richard Denning. You can buy TG at any of the following sites. Hi Richard, thanks for agreeing to the interview! 1. In Tomorrow's Guardian, Tom gets to travel back to various times including the Great Fire of London, the Zulu War and World War II. If you were able to travel through time, what would your destination be? I would love to be able to see some of the lost wonders of the World and the famous buildings and tourist attractions of the ancient world. In particular the Great Library of Alexandria would be high on my list. I would also like to be able to be present at some of the most spectacular occasions in history. Maybe see Cleopatra enter Rome, see the first flight or find out if Richard III really did offer his kingdom in exchange for a horse! 2. You've released a substantial preview of Tomorrow's Guardian on your website, giving people the chance to try 60 pages for free. How important do you think the internet is to spreading the word about a book now? Oh its critical I think. You cant just publish a book and expect it to sell. You have to be active and out there spreading the word and making contact with readers and potential readers. This means having a good profile on Amazon with lots of reviews, mentions on Goodreads and Shelfari, reviews in many blogs like your own. The effect of a book trailer on U Tube cant be underestimated. I have heard all this called Viral advertising and the Power of the Tribe. In other words the most significant influence on the interest in a book (or film, music track or a million other things) is word of mouth. 3. Do you listen to music when you write? If so, what did you tend to listen to while working on Tomorrow's Guardian? Not so much when I write. I actually like peace and quiet when I write. But I like to listen to music at other times to relax. I was a teenager in the 80s so the groups that had a huge effect on me would be Queen, Eurythmics, Billy Joel, Blondie, Status Quo and Elton John. I still listen to them today although my 14 year old daughter likes to educate me about Lady Gaga and others. 4. Being a GP, have you ever been tempted to write any books or scenes set in the medical world? I'd love to read about Tom travelling back to the Crimean War and meeting Florence Nightingale! That is a great idea about Tom in the Crimea: maybe one day. As for writing about medical scenes I am not so keen. This is because day to day like as a GP has its shares of stresses and a certain amount of drama and tragedy depending on which patients attend. I have always sought escapism from that world when writing and reading as well as TV watching. So I avoid the various medical soaps and programmes like the plague when off duty. For me its the world of SCi Fi and Fantasy and Historical dramas that appeal. 5. As well as being a GP and author you run UK Games Expo - where on earth do you find the time? I ask myself this a lot. General practice is a busy job and likely to get more busy with the government's plans to have GPs running the NHS (and I thought that was the job of NHS managers). That said in any job the key thing is to be organised with your time. I am quite efficient with use of time at work and at home I don't watch much TV (its amazing how many hours a week you get back if you only watch an hour or two a day). I am also a bit of an owl. So its 1 am as I write this and I am often up at this time. If you grab an hour or two at either end of the day when the children are in bed you can achieve quite a bit. 6. When growing up, what were your favourite fantasy series? When I grew up I tended to read a lot of mystery books rather than fantasy. This would include Famous Five and Secret Seven and the Three Investigators. A little later about 10 I read the hobbit and a little later still the Lord of the Rings which I have read many times. I did read some of the fantasy of the time including The Owl Service and The Weirdstone of Brisingamen. I also read and reread The Narnian Chronicles. I enjoyed Roald Dahl books as well. I went to university in 1985 and at that point and shortly after a huge amount of really good fantasy came along. Terry Pratchett's first Discworld books came out at that time, David Eddings had written the Belgariad and Raymond Feist Magician and there were many more. 7. Is there any advice you'd give to someone wanting to become a writer? Read a lot. I usually have three or 4 books on the go at any time. Dont just read fiction but also read around subjects that interest you - in my case historical subjects. Then when you start writing you have a background of experience. But you need not wait for years to go by. You can start writing at any age. Enter competitions if you like so that you start to get some feedback. Just keep writing though because you will get better. Oh and you might check out New Writers UK - a great group of writers who support each other. 8. As you know I loved Tomorrow's Guardian but was also a massive fan of another of your books, The Last Seal. A particular part of that book which I enjoyed was the cameos from real life historical figures - if you could write a book about anyone in history, who would it be? I hope to have The Last Seal out in paperback later in the year by the way. But to answer your question I have quite an interest in the Anglo Saxon Period and have written a historical fiction - The Amber Treasure - set in the 6th century. I had thought at one point of writing about Alfred the Great but alas Bernard Cornwell beat me to it ;-) There are a lot of really fascinating people in this long past era who forged the England in which we live today but about which most people know nothing.So its fun to write about them - to pick away at the scanty records that exist and try to bring them back to life. 9. And I know that you last year released the board game Great Fire: London 1666, which was set during the Great Fire of London (as the title suggests, I suppose!) like The Last Seal. 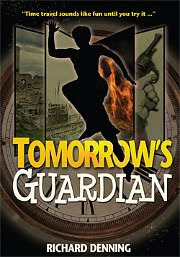 Would you consider a Tomorrow's Guardian game? If so what kind of things would you put in it? Actually what might work quite well is a game based around the sequel (Yesterday's Treasures) which I hope to have out in a few months. That is at least in part a treasure hunt across history. This could be a fun game - with players having to grab artefacts from past centuries. 10. Without spoiling Tomorrow's Guardian for those people yet to read it, any hints as to what we can expect from the sequel Yesterday's Treasures? Everyone is searching for pieces of 'The Crown of Knossos:' historical artefacts which when assembled allow control over all of history in this and in the Twisted reality. The Hourglass Institute, Redfeld's masters and even the Directorate are soon in the hunt. One by one the pieces are found but eventually Tom and the others discover who is really after The Crown and what their motivations are. It is only then that they realise the extent of the danger, for 'Yesterday's Treasures' can mean the destruction of tomorrow. Richard was born in Ilkeston in Derbyshire, UK and lives in Sutton Coldfield in the West Midlands. He works as a General Practitioner (family doctor)with a North Birmingham practice. He is 43 and married with two children. He is a Young adult sci-fi, historical fiction and historical fantasy writer. He also writes book and board game reviews and online articles on historical and gaming related topics. He owns his own small publishing house, Mercia Books and is part of a board game design house Medusa Games. A keen player of board games and other games he is one of the directors of UK Games Expo (the UK's largest hobby games convention). He is a board game designer and his first Board Game, 'The Great Fire on London 1666' was published by Medusa Games and Prime Games in October 2010.